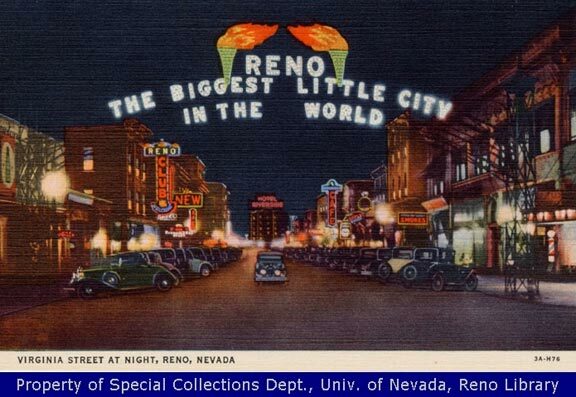 The original Reno Arch, built in 1926, didn't say "The Biggest Little City in the World." 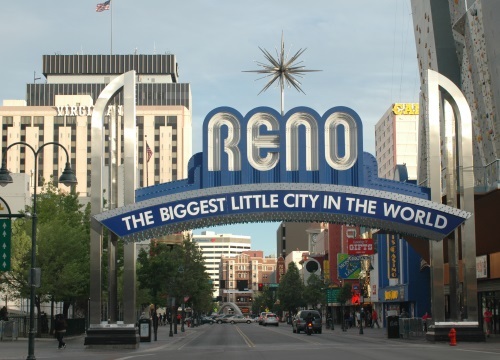 It wasn't erected to add glitz to a downtown casino district (casino gambling didn't become legal in Nevada until 1931), or even as a sign intended to symbolize Reno's city pride. 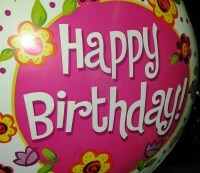 So what's with this famous symbol? It was inspired by the automobile and, more specifically, the completion of America's first coast-to-coast motor routes, The Lincoln Highway and The Victory Highway*. The first iteration of the arch, planted at Virginia Street and Commercial Row, and dedicated by a cadre of Nevada and California politicians on October 23, 1926, promoted the Nevada Transcontinental Highways Exposition (held in Reno from June 25 to August 1, 1927). Subsequent incarnations of the arch are at the same Virginia Street location. 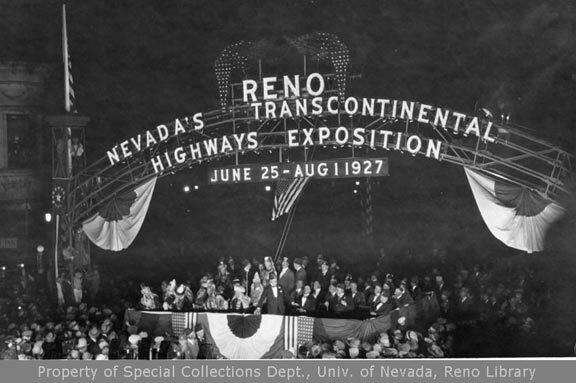 The transcontinental highways being important to commerce in both Nevada and California, the dedication was attended by both governors, poohbahs from the San Francisco Shriners, marching bands, and lots of ordinary citizens. Original arch modified with "The Biggest Little City in the World." (Click image for enlarged view.) The party ended, but the arch still spanned Virginia Street, announcing an event that had come and gone. What to do? Well, tearing down a perfectly good steel arch didn't seem like a good idea, so the city fathers decided to hold a contest to come up with a slogan to replace the exposition name and dates. 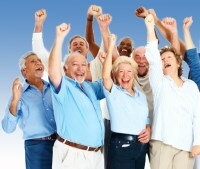 The winner of the $100 prize was one G.A. 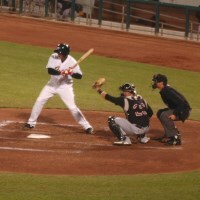 Burns of Sacramento with "Reno, The Biggest Little City in the World." With that settled, the new arch slogan was duly installed. 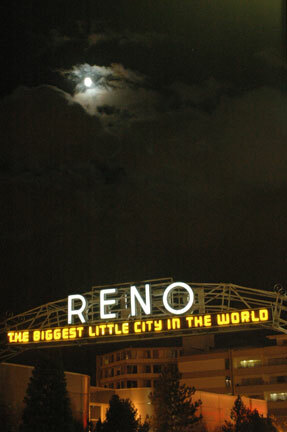 Photo by Stan White of NewToReno.com It didn't take long for some folks to tire of the new slogan and it was removed. That didn't sit well with other folks, who apparently had more influence. After this little dustup, the slogan was put back. 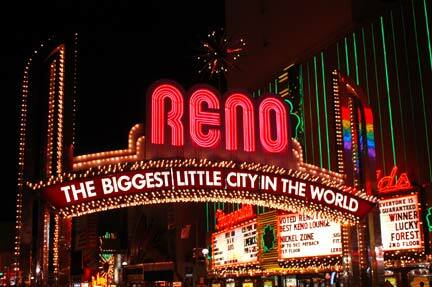 In addition, neon, the new lighting miracle, was added to make the arch a blazing welcome to Reno. Another modification was the removal of the torches. 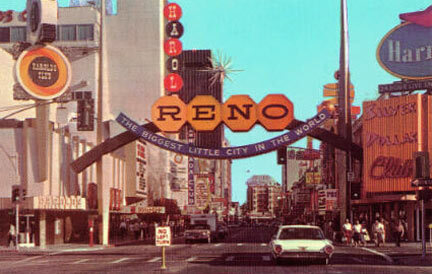 By around 1935, the Reno Arch was configured as it would be until 1963. By then, Caddies and Corvettes had replaced Model Ts, necessitating an arch upgrade to reflect the new transportation realities. The '35 to '63 arch didn't get ditched when it was replaced. It was first moved to the exposition site, Idlewild Park, then to Paradise Park. It was understandably getting a bit rickety after almost 40 years, so into storage it went until once again called into service. Moviemakers placed it over E. 4th Street as a prop in the 1994 film Cobb. In 1995, it migrated once again, to what should prove its final resting place. Drive down Lake Street, between the National Automobile Museum and the Renaissance Hotel, and you will pass under the steel girders of the original Reno Arch. 1963 Reno Arch lives on in Willits, California. (Click image for enlarged view.) This next Reno Arch was a major transformation. Out with the steel framework, in with glowing plastic and a sparkling rotating star. This arch was called by some the "mod arch" or "hippie arch." Look around the picture and you'll see that it goes with the signage that was then in vogue on Virginia Street. Today's Reno Arch, spanning Virginia Street in downtown Reno. (Click image for enlarged view.) By 1987, the hippies were gone and so was the contemporary look of the mod arch. This time, though, the replaced arch didn't bounce around town looking for a landing place. 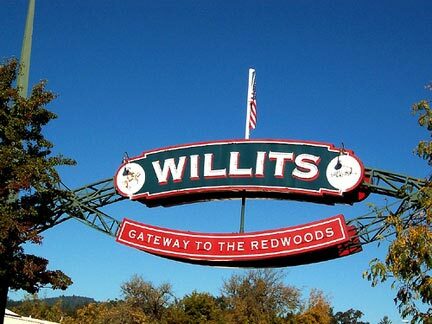 It was donated to the northern California town of Willits. In this incarnation, it straddles US 101 and welcomes visitors to Mendocino County and the towering coast redwoods. 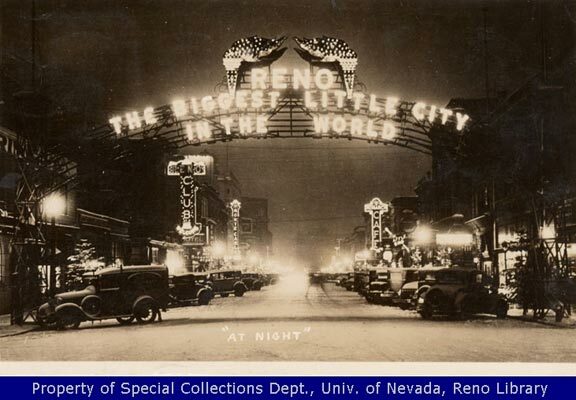 Meanwhile, local outfit Young Electric Sign Company built the Reno Arch still standing today. 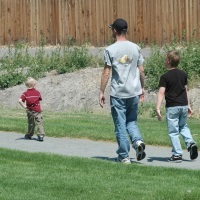 It remains to be seen how long it will last considering the rapid pace of change sweeping through Reno's core. 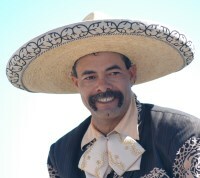 Stay tuned for the next edition, coming who-knows-when to the same location. The latest version of the Reno Arch is a facelift of the existing structure performed in early 2018. The uprights on either side of the street went from gold to silver and the arch went from red to blue. The lighting was updated to LEDs. Additional information is available from "History of U.S. 40 (The Victory Highway)."